Flew out to the new fissures today accompanied by Tim Orr of USGS (flown by David Okita of Volcano Helicopters, of course – he set up some great aerial shots for me today – click on photo to see video clips). We got put down right below the fissures and upwind of the huge channels barreling down the slopes of Pu`u `O`o, and spent a few hours following the flows. Even though it has been days since the fissure broke open, there were still good-sized open channels. We had to climb up on some pretty hot flows to get a good view. I was a little worried about the boot soles, but they held up fine. We did have some cooler ground to retreat to. The terrain up here is all shelly pahoehoe – hollow rolls of lava that form near vents. The rock is generally one or two inches thick – and thus collapses easily under your weight – but the hollow spaces you fall into can be a lot deeper than that. Bad enough if it’s cold, but a real bummer when it’s hot. I made it without any shin injuries and only got a little stuck once. Walking in the folds helps because it is a little thicker there, though you end up having to contort your ankles a bit. 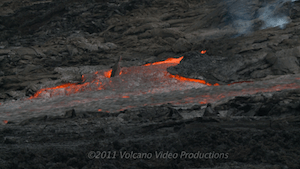 Up near the fissure, where the cone is steeper, the lava in the channel was moving fast – it was very impressive. Closeup shots were hard to get through the intense heat waves, though. The sound was also very difficult to capture through the wind and buzzing helicopters. The fissure would make the occasional jetting and hissing noises, while the sound of the channel itself is more of a rustling, whispering sound, interspersed with thumps and clinks and rattles as solid bits of crust scrape against the sides. I was reminded as we picked our way along the channel that this job is much easier with two people. Fortunately Tim offered to carry the tripod, which helped a lot. You really want a hand free when walking on shelly pahoehoe. The problem with working on hot ground is that you can’t set anything down, so setting up a tripod and camera, getting a drink of water, taking gloves on and off, changing batteries… it all requires a lot of maneuvering. You can’t set the backpack down or the nylon might begin to melt. We were wearing flight suits and heavy boots, of course, so the heat was manageable, except when we got really close to the channel – there the radiant heat was intense. Fortunately David let us leave our helmets and my shooting rig in the chopper. The last place we made it to was the most spectacular – a huge lava falls with a pond at the base. We were able to get right up to it and look down into the incised channel. The lava at the base of the falls was splashing up like a small dome fountain and occasionally spattering lava on the walls. The amount of lava seemed to wax and wane a bit. We’d noticed along the channel above how the crust would build along the sides and then break away as the lava level rose. Not sure how much is local effects (constriction of the channel forcing the level to rise) or an actual change in effusion rate of the lava. 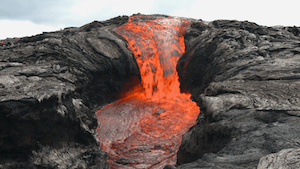 But by the time the lava reached the falls it would increase and decrease noticeably. And wow, the falls were impressive. Altogether a great filming day. Congrats to Jen Wenner, our quiz winner! Jen will receive a copy of our “Eruption Update” DVD + Bluray. Great job, Jen! 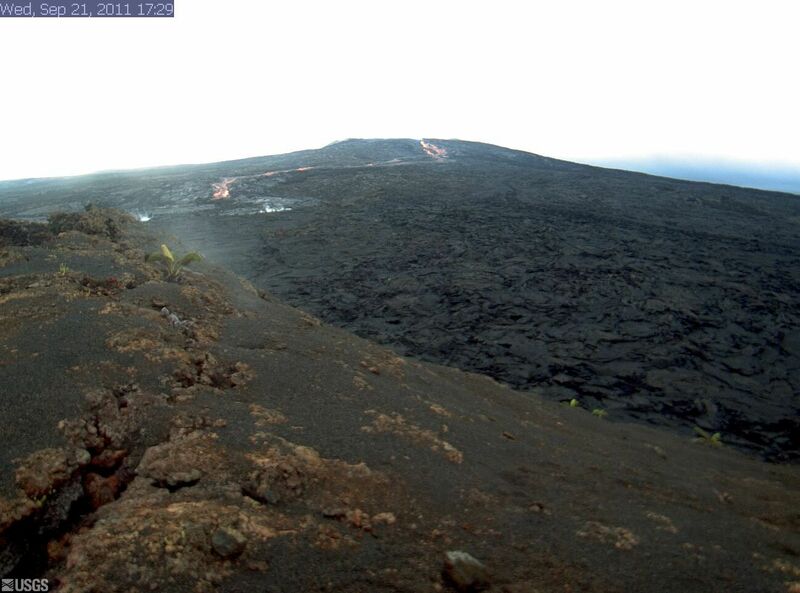 Lava broke out of the upper east flank of Pu`u `O`o today, sending channelized flows downslope. We’ll see if they continue. This event follows an abrupt 50 (!) microradian inflation last night. Lava breakout from the east flank of Pu`u `O`o at 5:40pm on Sept.21, 2011. 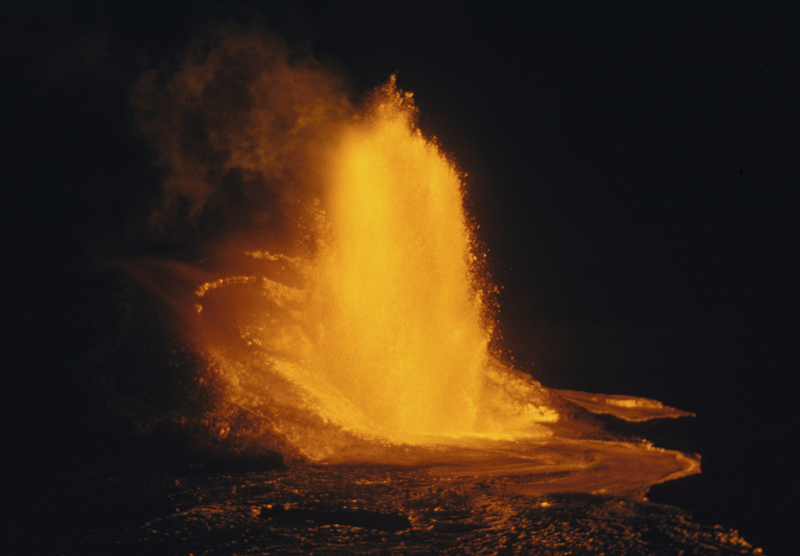 This month’s Quiz question asked about the highest lava fountains recorded on Kilauea. The answer? On Dec. 14, 1959, phase 15 of the spectacular Kilauea Iki eruption began with jets of lava briefly reaching 580 meters (1900 feet) high! The quiz winner will be announced shortly. Huge lava fountains shoot from the Kilauea Iki vent at night. USGS photo. Kilauea Iki lava fountains covering Crater Rim Drive, Nov. 29, 1959. Photo by USGS. This week’s featured volcano is a beautiful giant, a classic symmetrical, snow-capped stratovolcano towering over its surroundings and sending small eruptions into the atmosphere. 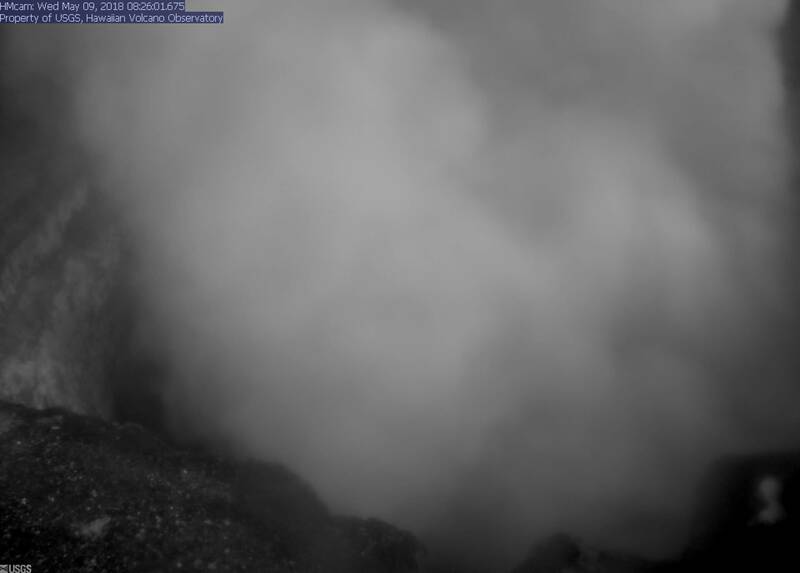 However, it’s the proximity to 21 million people that makes this volcano one to watch. Although the last 1200 years have been fairly quiet, there is a longer history of larger and much more dangerous eruptions. Ash and steam emissions from Popocatépetl Volcano, Mexico. Photo by CENAPRED, 1994. Most Recent Activity (Week of August 29-September 4, 2011): Frequent emissions of gas, ash and steam reported by CENAPRED, along with harmonic tremor (volcanic earthquakes) and possible lahars (ashy mudflows). On August 30, a plume of ash rose 1 km into the air and deposited ash on towns 19 km away. 1996 (active ~1994-2003) Moderate eruption. Episodic explosions produce ash and pumice emissions. A small lava dome grows on the crater floor. 5 people were killed close to the crater rim during an explosion in May, 1996. 1919-1920 Moderate eruption. Episodic explosions produce ash and pumice emissions. A small lava dome grows on the crater floor. Several people died inside the crater. Geologic History: This glacier-clad stratovolcano contains a steep-walled, 400 x 600 m wide crater. At least three previous major cones were destroyed by gravitational failure during the Pleistocene, producing massive debris-avalanche deposits covering broad areas south of the volcano. The modern volcano was constructed to the south of the late-Pleistocene to Holocene El Fraile cone. Three major plinian eruptions, the most recent of which took place about 800 AD, have occurred from Popocatépetl accompanied by pyroclastic flows and voluminous lahars that swept basins below the volcano. For the last 1200 years, eruptions have been minor to moderate in scale (lava domes, ash-producing explosions, fumaroles). In the 20th century, there was a quiet period between 1947 and 1994, when activity resumed. Since 1996 small lava domes have been constructed within the summit crater and destroyed by explosive eruptions. Intermittent small-to-moderate gas-and-ash eruptions have continued, occasionally producing ashfall in neighboring towns and villages. Info from CENAPRED and the Smithsonian Global Volcanism Network. This volcano is featured in Volcanic Disaster. 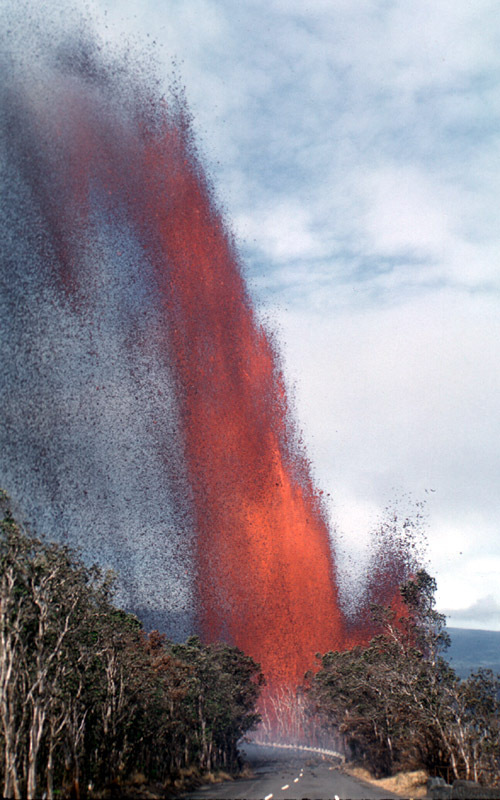 Here’s our first Kilauea Quiz of the Month. One lucky winner will be chosen from all the correct entries to receive a prize. 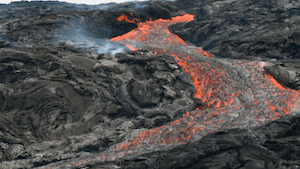 Test your knowledge of Kilauea, or have a little fun looking stuff up! Click on the button below and the quiz should pop up. New Eruption Update is released! At last, we’ve released the latest Update: Fall 2011. 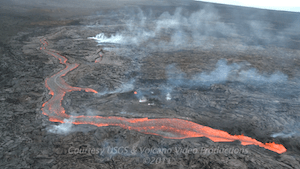 Very excited about this one – it contains some great USGS footage from the fissure eruption of March, including an infrared timelapse sequence of the lava lake in Halemaumau draining, and our footage of the very active lava lake in Pu`u `O`o. I’ve also revised “Songs of the Molten Earth” – an extra on the Blu-ray – adding some great new footage to that, too. Check it out here.